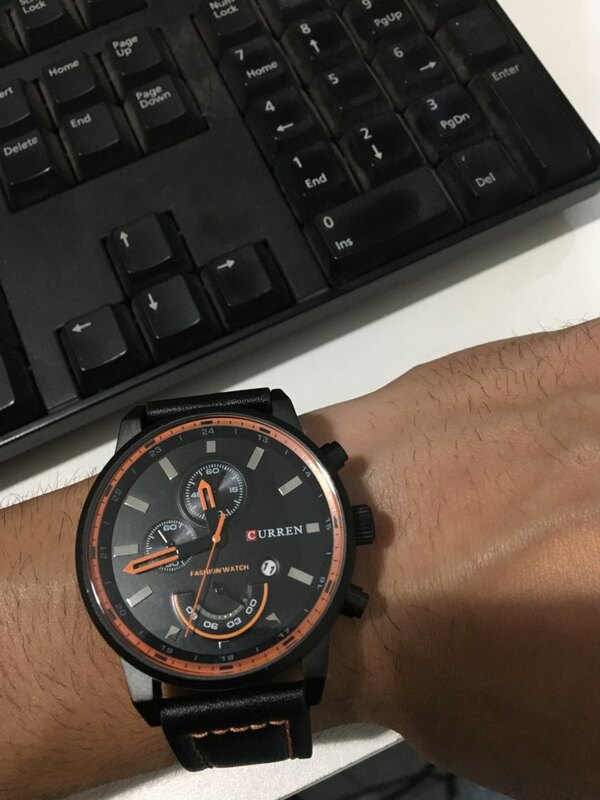 From CURREN comes this very fashionable and sporty watch for men. Ideal for both formal and casual occasions such as meetings, work, nights out, sports, etc. The body of the case is made from a metal alloy with a stainless steel back plate and houses a highly accurate Seiko, Japanese quartz movement. The dial window of the watch is made from tough, scratch resistant Hardlex glass and the band is made from leather. The watch is also water resistant to 30m, has a calendar and a chronograph consisting of three mini dials showing seconds, minutes and hours. The resulting watch is robust, practical, great looking and perfect for everyday use. Available in three different colour variants (Grey Grey, Black Black, Orange White) to suit personal preference and would make an excellent gift for male friends, loved ones and family. While this watch is rated as water resistant to 30m, it is not suited for diving, swimming or use in the shower. The water resistance is more suited to resisting heavy rain and accidental splash or submergence in water. Um pouquinho menor do que eu imaginei, porem muito bonito, material bom e chegou antes do prazo, tudo certinho conforme descrição! Recomendo ..